There’s a point in every metalsmith’s early career where they realize that they are tired of compensating for their mistakes, tired of making something that is the best they can do, but still not quite what was pictured. There’s a desire to make a piece from beginning to end, exactly how it’s pictured in the mind – but a small gap in technical skills gets in the way. Here’s an example of a tiny technical error that affected my work. The worst part is that I knew better. 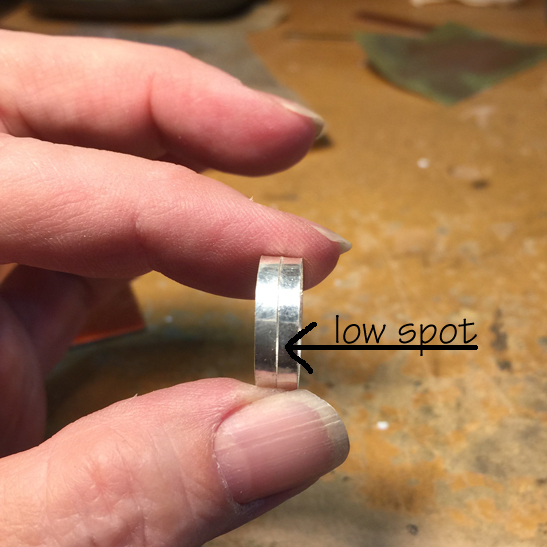 If you’ve ever sanded a ring of some kind, whether a bezel, a finger ring, the side walls of a box, or even the rim of a domed disk, chances are, you’ve had to deal with having sanded a low spot. There’s one particular low area that prevents the entire edge from being even. Since metal is stubborn and won’t grow when we need it to, the only solution is to file the entire edge down to the height of the low spot, which can have an effect on every aspect of your project’s design from that point forward. You start compromising on your original vision. How much better to prevent the low spot to begin with? See the photo at right showing the two bezels? I was sanding the edges to make them the same height and I got lazy. I started sanding back and forth, as we’ve all done when we haven’t been taught otherwise (and some of us, even when we have). Do this little experiment. Picture a large figure eight on some flat surface near you and slowly rub one finger along it, noting the shift of the pressure on the pad of your finger from front to back and side to side as you complete the course of the symbol. The same situation happens when you’re sanding. 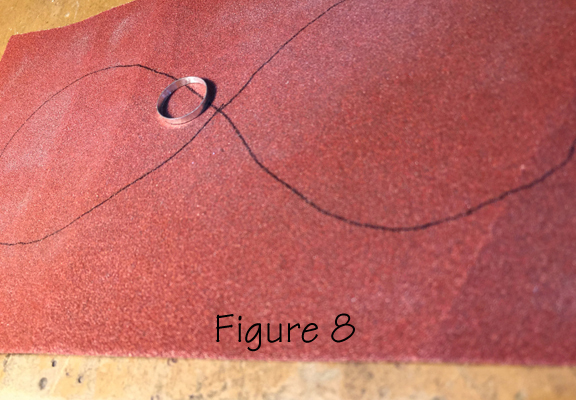 If you sand in a figure eight pattern, you subtly shift your weight from one point to another as you sand along the shape, and therefore the rim stays even. If you just sand back and forth, you’re going to sand a low spot into the rim because you’re putting weight on only limited areas. It’s such a small change in work habit, but realizing that the change needs to be made is exactly the point where we reach, stretch, and become better smiths and produce better quality work.